Hello! 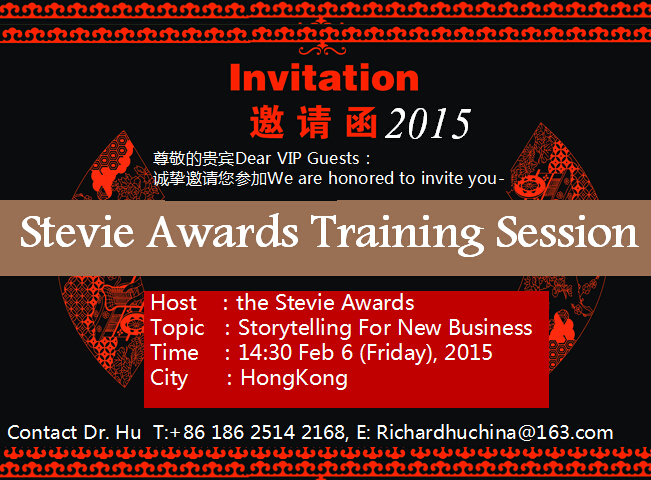 We invite you to attend a free seminar about the importance of Corporate Storytelling, presented by the Stevie Awards in Hong Kong on February 6, 2015. To be successful in today’s communications environment, it is critical that organizations be able to summarize and communicate their successes in a manner that will engage and inspire their customers, employees, and other stakeholders. This seminar will discuss the importance of Corporate Storytelling and will show you how to communicate the achievements of your organization in the best possible way in China.. The seminar is presented by the Stevie Awards, which have been called "the business world's own Oscar Awards.” The Stevie Awards present international business awards programs such as The International Business Awards and the Asia-Pacific Stevie Awards. Organizations in more than 60 nations submit more than 8,000 nominations to Stevie Awards programs each year. The best of these nominations are prime examples of excellence in Corporate Storytelling. You will discover the benefits of Corporate Storytelling, and how preparing and submitting entries to Stevie Awards competitions can benefit the development of a Corporate Storytelling strategy. You will also have an opportunity to network with other CEOs and communications executives. Invest two hours in this seminar to learn how your organization can benefit by improving your Corporate Storytelling. We trust you will come away from the event will several useful ideas for your organization. Seating is limited(30 people) so reserve your seat at the seminar before Feb 3rd (Wednesday), 2015.